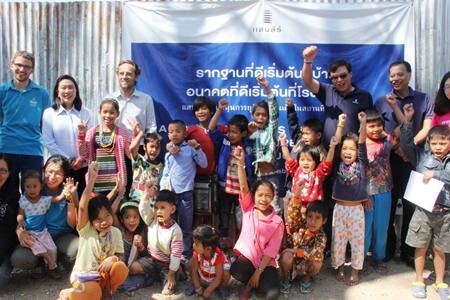 Kids who benefit from the Safety Zone project are joined by Aphichart Jutrakul, managing director of the Sansiri, Bijaya Rajbhandri, from UNICEF Thailand and Nicola Lrosta, founder of Kids Home Foundation at the D-Condo construction site. Sansiri, the property development company, has joined with UNICEF and the Kids Home Foundation to launch the Safety Zone for Children in Construction Sites project which will provide at risk children with a safe place to learn and play. Aphichart Jutrakul, managing director of the Sansiri (Public Company) was joined by Bijaya Rajbhandri, from UNICEF Thailand and Nicola Lrosta, founder of Kids Home Foundation to announce the project at the D-Condo construction site, Rat-Uthit Road. The project has been running in 7 locations since 2012-2013 and 15 more locations in 2014-2015. Aphichart said that the CSR activity was held to focus on the development of children and youth. He added that a company must be aware of all problems in general and must cooperate with other organizations involved in solving these problems. The Sansiri Social Change project, which includes Good Space, Good Education, Good Nutrition, Good Sports and Good Will, has been running since 2012 when the company announced that they required all contractors to sign a letter of agreement to not use under age laborers. The safety zone has been enforced in all participating organizations for children under the age of 14, regardless of nationalities to learn the basics and be aware of the dangers in a construction site. Most construction sites are under construction for at least 1,300 days of construction and the children at construction site will obtain an education during that period. The safety zone policy has now been enforced in 17 different locations throughout the country and will hopefully encourage other companies to do the same. Any company can have a safety zone for the protection of children. Bijaya Rajbhandari of UNICEF Thailand said that Thailand is dedicated to the rights of children and for them to learn for a better life quality in the future, regardless of nationality. Sansiri has granted the opportunity for all children in construction sites to learn, grow and develop their knowledge before they go to school. Over 20 children take part and receive a proper education with the cooperation of the NGO and the advice of the Kids Home Foundation which has proved to be a successful combination.